Reflection is one of the unique properties of light. It is the reflection of light, which enables us to see any object. Reflection:- The bouncing back of rays of light from a polished and shiny surface is called reflection or reflection of light. It is similar to bouncing back of a football after colliding with a wall or any hard surface. The angle of incidence and angle of reflection is equal. The incident ray, reflected ray and normal to the point of reflection lie in the same plane. 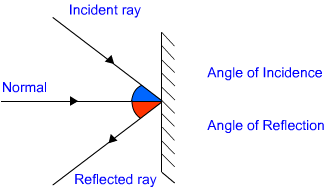 The angle of incidence is denoted by 'i' and angle of reflection is denoted by 'r'. The law of reflection is applicable to all types of reflecting surface. Mirror is a shiny polished object (glass) which reflects most of the rays of light falling upon it. One side of mirror is polished with suitable material to make the other side reflective. Types of Image formed by mirrors:- Real and Virtual. Real image:- Image which is formed in front of the mirror and it can be obtained on a screen is called real image. Virtual image:- Image which is formed behind the mirror and cannot be obtained on a screen is called virtual image. Types of Mirror:- Plane and spherical. Plane Mirror:- A mirror having a flat surface is called plane mirror. A plane mirror always form virtual and erect image. The distance of image and that of object is equal from the mirror. The image formed by a plane mirror is laterally inverted. Spherical Mirror: Mirrors having curved reflecting surface are called spherical mirrors. A spherical mirror is a part of a sphere. Type of spherical mirror: Spherical mirrors are of two types - Concave and Convex. Concave Mirror: Spherical mirror with reflecting surface curved inwards is called concave mirror. Convex Mirror: Spherical mirror with reflecting surface curved outwards is called convex mirror. Pole: The centre of reflecting surface of a spherical mirror is known as Pole. Pole lies on the surface of spherical mirror. Pole is generally represented by 'P'. Centre of Curvature: The centre of sphere; of which the reflecting surface of a spherical mirror is a part; is called the centre of curvature of the spherical mirror. Centre of curvature is not a part of spherical mirror rather it lies outside the mirror. Centre of curvature is denoted by letter 'C'. In the case of concave mirror centre of curvature lies in front of the reflecting surface. On the other hand, centre of curvature lies behind the reflecting surface in the case of convex mirror. Radius of Curvature: The radius of sphere; of which the reflecting surface of a spherical mirror is a part; is called the Radius of Curvature of the spherical mirror. The radius of curvature of a spherical mirror is denoted by letter 'R'. Similar to centre of curvature, radius of curvature lies in front of concave mirror and lies behind the convex mirror and is not a part of the mirror as it lies outside the mirror. Aperture: The diameter of reflecting surface of a spherical mirror is called aperture. Principal Axis: Imaginary line passing through the centre of curvature and pole of a spherical mirror is called the Principal Axis. 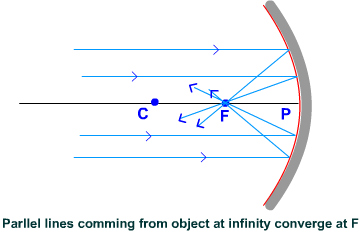 Focus or Principal Focus: Point on principal axis at which parallel rays; coming from infinity; converge after reflection is called the Focus or Principal Focus of the spherical mirror. Focus is represented by letter 'F'. 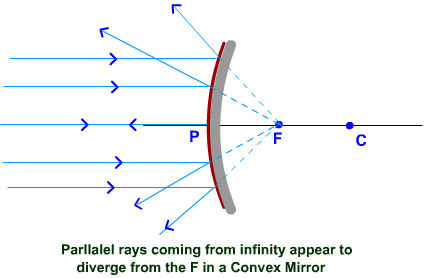 In the case of a concave mirror, parallel rays; coming from infinity; converge after reflection in front of the mirror. Thus, the focus lies in front of a concave mirror. In the case of a convex mirror, parallel rays; coming from infinity; appear to be diverging from behind the mirror. Thus, the focus lies behind the convex mirror. Focal length: The distance from pole to focus is called focal length. Focal length is denoted by letter 'f'. Focal length is equal to half of the radius of curvature. Light: Reflection and Refraction will be available online in PDF book form soon. The solutions are absolutely Free. Soon you will be able to download the solutions.